I have added yet another Swirl to my ever growing collection. 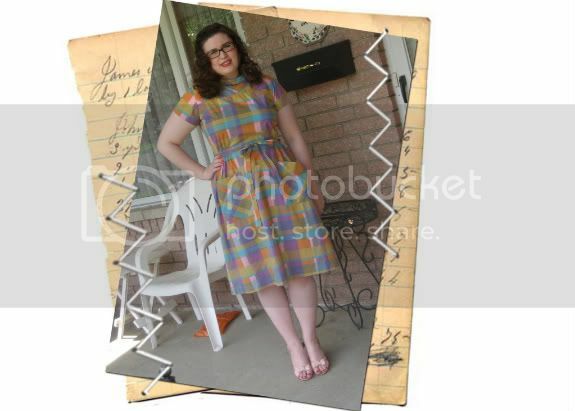 I swear these dresses are addicting and I can see why so many vintage gals love them so. I loved the color scheme and the high collar on this one -- definitely different than most of the Swirls out there. I paired it with some pink sandals I got an estate sale last summer. My hair inspiration came from Lizabeth Scott. I adore her 40s hair and it is so easy to recreate not to mention a great style for girls with bangs, since you need to pin back one side. That's so cute! Looks great! ooh, madras is so fun and perfect for summer! Lovely dress and it fits you perfectly!! i adore your swirl dresses. this one is so pretty. i love the pastel plaid. Ooh, what a gorgeous Swirl, I love the plaid. I still do not have a Swirl, I must hurry before every other vintage gal buys them haha! And your hair is looking very lovely.